The Andersen Company has many different mats for all sorts of situations. Among their choices, the Super Scrape Entrance Mats collection has a number of styles and variations for different applications. 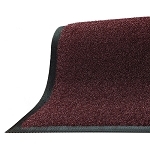 All floor matting is made of 100% nitrile rubber, making them slip-resistant and safe. Plus, all Superscrape padding is environmentally friendly and its construction consists of recycled material. 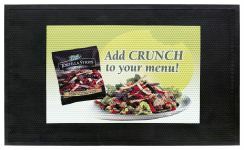 Impressions message mats have no set-up charge and provide a limitless choice of color options, as well as 25 vibrant colors to really make it pop! Andersen impressions floor matting is impervious to sunlight, and resistant to oils and chemicals. Designed to be tough, these sign pads scrape away at tough dirt and grime; Super Scrape Impressions Message Mats are great for indoor and outdoor use, especially in high-traffic areas. 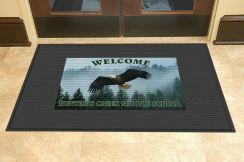 Andersen molded welcome matting comes in two variations, printed with a horizontal or vertical message. There is a one-time set-up fee for these bi-level constructed mats. Designed to trap dirt, grit, and moisture, this welcome padding is best suited for entrances. 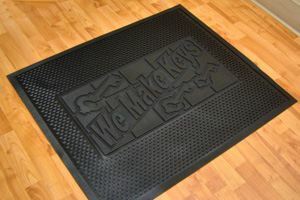 Super Scrape Signature Logo matting is made of nitrile rubber, and display a digitally printed logo that is molded into the padding. The digital image is thermo-plastic, making it malleable in heated conditions and solid again once it cools. Anti-static and easy to clean with a vacuum, it doesn’t get simpler than Andersen Superscrape signature logo mats. This product is custom and requires a logo submitted and color option to create mat. Message Size: 7" x 13.5"
Static Decay Test Method 4046 Federal Standard 101B/NFPA 99 Chapter 12 Section 4.1.3.8 (f) (3) (i) Maximum Time Recorded: 01 seconds. Max Design Dimensions 7.5" x 13"
FM-AND-3669-35 3x5 (34" x 54.5") 7" x 13.5"
FM-AND-3669-46 4x6 (45" x 67.5") 7" x 13.5"
Note: Pricing for Logo Mat products is based on individual design number. Different design numbers may not be combined for quantity discounts.